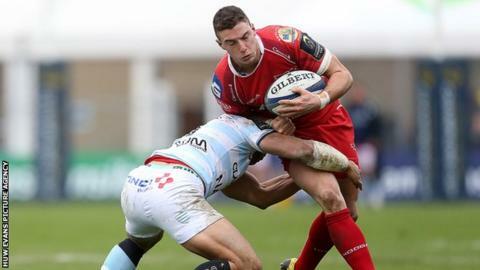 Scarlets fly-half Steven Shingler is out of action for around eight weeks. In a blow to the Scarlets' Pro 12 title ambitions, head coach Wayne Pivac confirmed that Shingler damaged his medial knee ligament in the dramatic win over Edinburgh last weekend. "We had thought it was worse than it is, but it could be anywhere in the range of eight weeks," Pivac confirmed. "It is unfortunate. Steve earned the right to start and he did well against Edinburgh before the injury." Ulster host Scarlets in the Pro12 on Sunday, the first game Shingler will miss as the Welsh team battle to remain among the competition's main contenders. Coach Pivac feels the Scarlets' victory over Edinburgh last time out could be a defining result. "It could be a season changer for us. A defeat would have pushed us out of the top four. So it was a very, very good win for us," he said. "It is pleasing to come out with the win in many tight games this season, at the death we have done especially well." Pivac also confirmed that flanker James Davies is closing in on his comeback, having been injured since the end of November. "James is running well, he has had another scan, which has been really positive and he is not far away," he said.